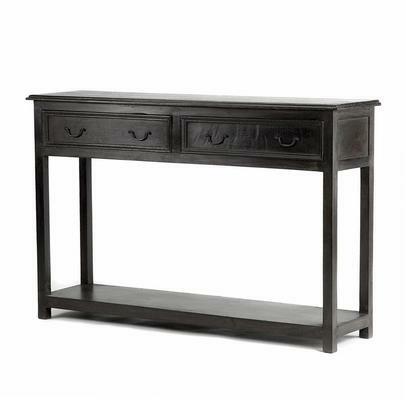 A larger version of the one drawer console, this Two Drawer Wooden Console Table gives you twice as much room and a wider size. Unlike the smaller version, this one is made from a combination of mango wood and MDF. 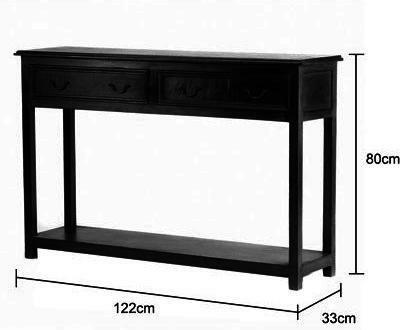 There's a smooth top surface perfect for holding a lamp, a vase of flowers or even an array of picture frames. Two spacious drawers are also found at the front. Each drawer comes with antique style metal handles for easy opening and closing. At the bottom, there's a single shelf which you can use to display items as well. The entire thing is painted in a lovely black finish and then lightly distressed to create a vintage effect.